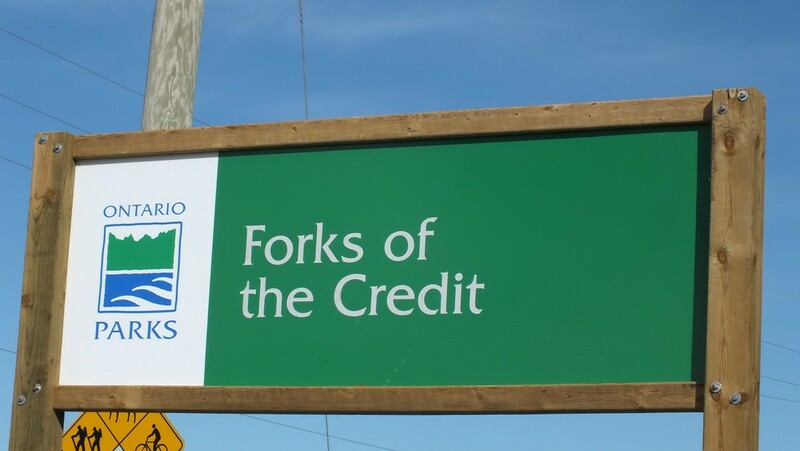 On a warm, sunny June morning, Bob and I set off to explore Forks of the Credit Provincial Park near Caledon, Ontario. We had never visited that park before, but it seemed a likely destination for us given the bird sightings reported there over the previous few days. We were excited to see what species we might discover. 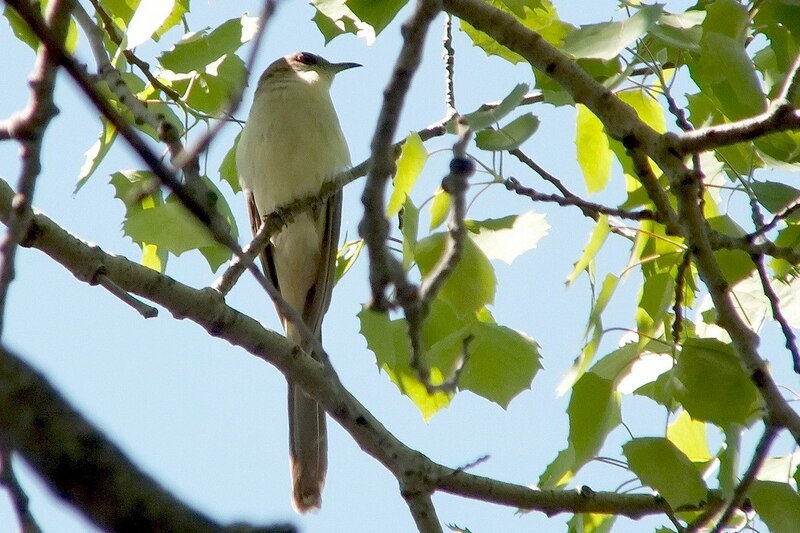 As we followed the movements of an Eastern Towhee, lo and behold, we caught sight of another bird in the same tree: a Black-billed Cuckoo. Forks of the Credit Provincial Park, as we soon saw, features myriad trails through a variety of beautiful landscapes, and the best thing of all is that the park is set aside for the sole purposes of hiking and walking, or cross-country skiing and snowshoeing during the winter months. 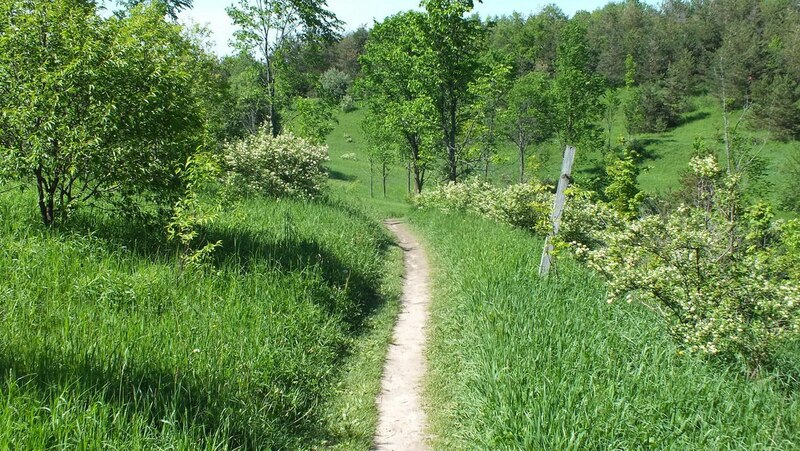 The day Bob and I visited the park, numerous walkers and birdwatchers could be spotted along the trails, but the expansiveness of the area meant that we were by ourselves most of the time. As we walked along the Trans Canada Trail, a beautiful vista revealed itself through a gap in the trees. 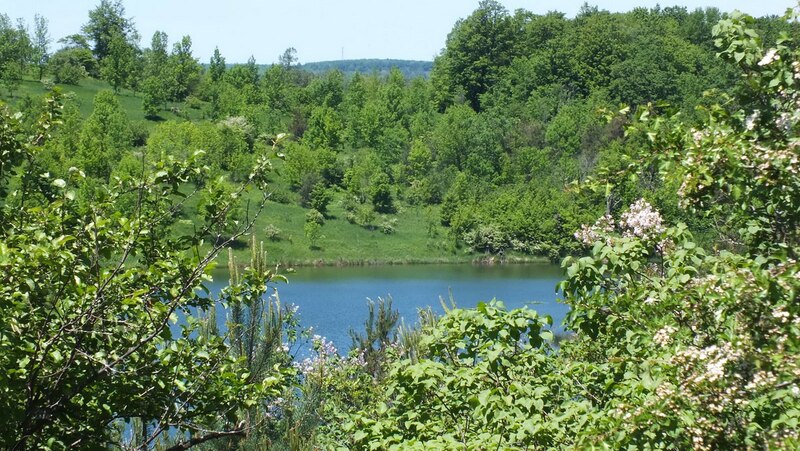 Kettle Lake, a remnant from the last ice age, sits prettily tucked at the base of a circle of gently sloping hills. That topography is referred to as kettle and kame, with a kame hill being an irregular shaped hill that resulted from glacial deposits as a glacier retreated, and a kettle lake being carved by the same glacier. 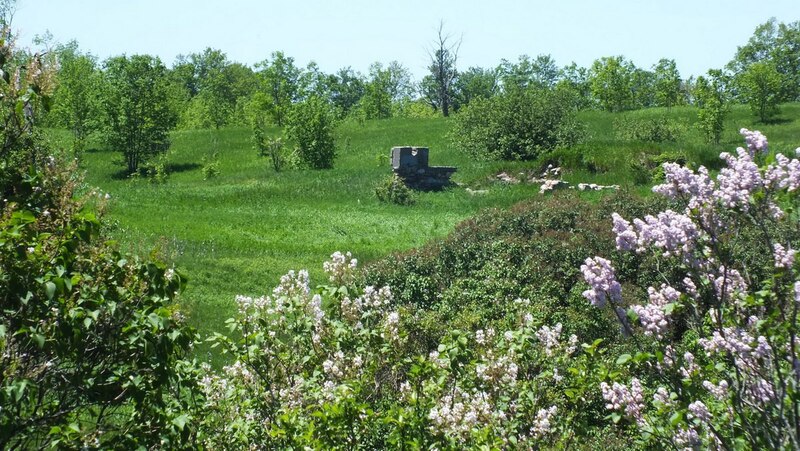 All along the trail, a rich variety of trees and shrubs titillated our senses, and yet again, an unexpected break in the foliage had us viewing a gorgeous scene of historic ruins on an opposing grassy knoll. The history wrapped up in that crumbling edifice left us eager to explore the site later in the day. For the time being, our planned route would take us elsewhere. It was along a section of the Bruce Trail, where it connects to the Meadow Trail, that Bob and I came across this very large bird secretively perched near the top of a tree. The first thing we noted was the bird’s snowy white breast. 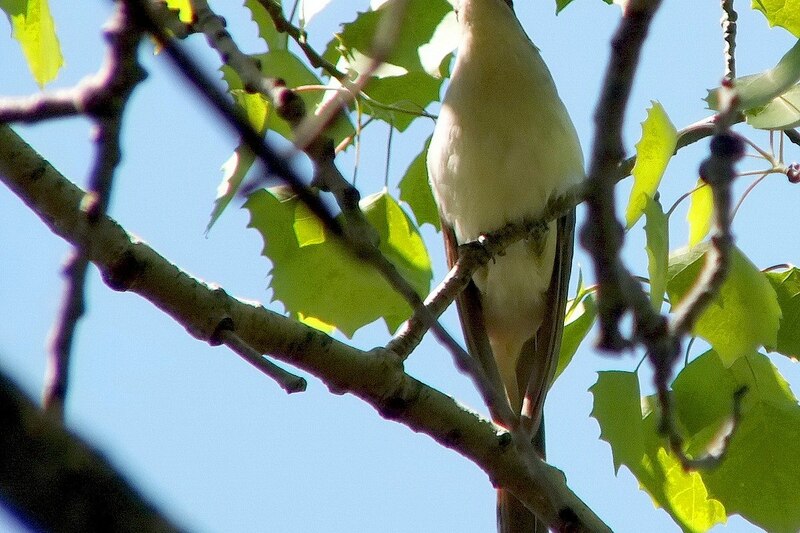 From our position below the tree, we primarily had a view of the cuckoo’s underparts, so the pattern on the underside of the tail was noted, as well as the white tips of the tail feathers. 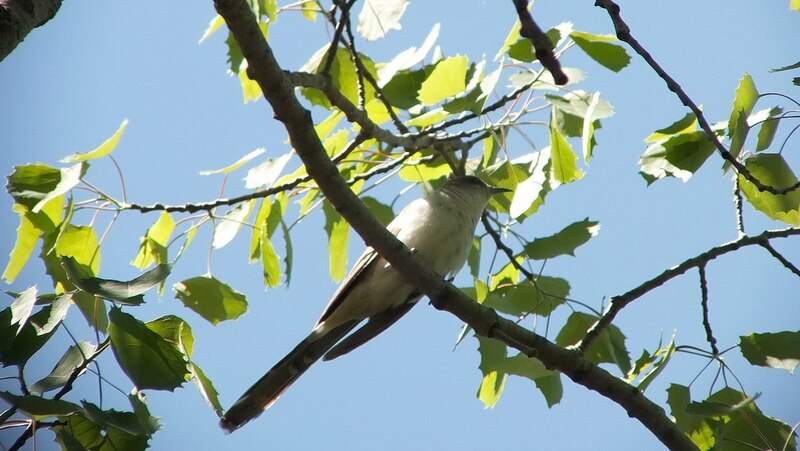 Together with the red eye ring, visible in the first photograph, I believe this cuckoo is an adult since young cuckoos do not show a red eye ring. 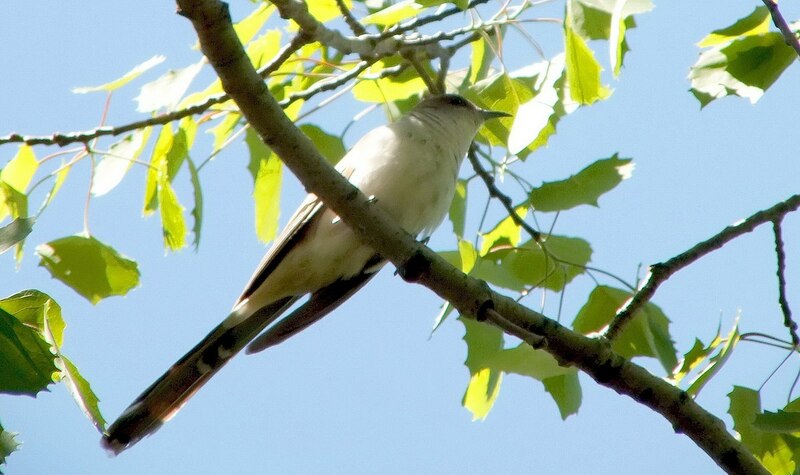 As the breeze jostled the leaves, the cuckoo literally was bounced about by the bobbing branch upon which it sat. 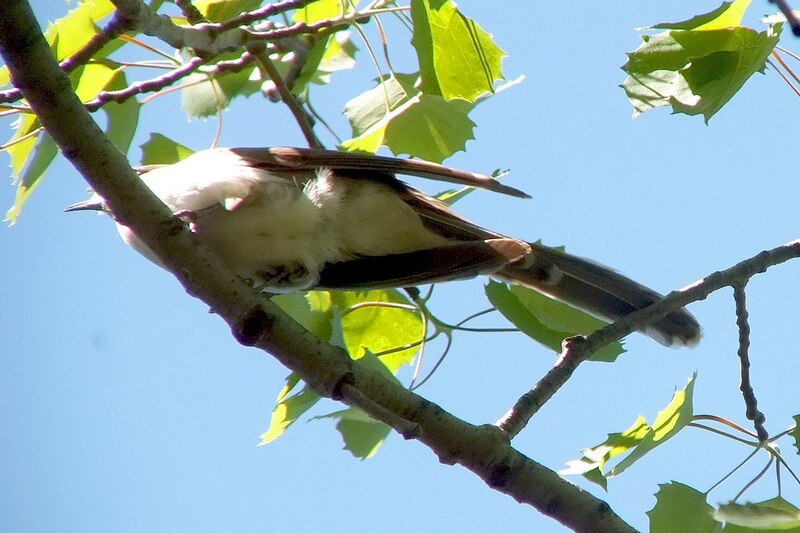 That is when we had a clear view of the cuckoo’s extremely long tail and pointed wings. 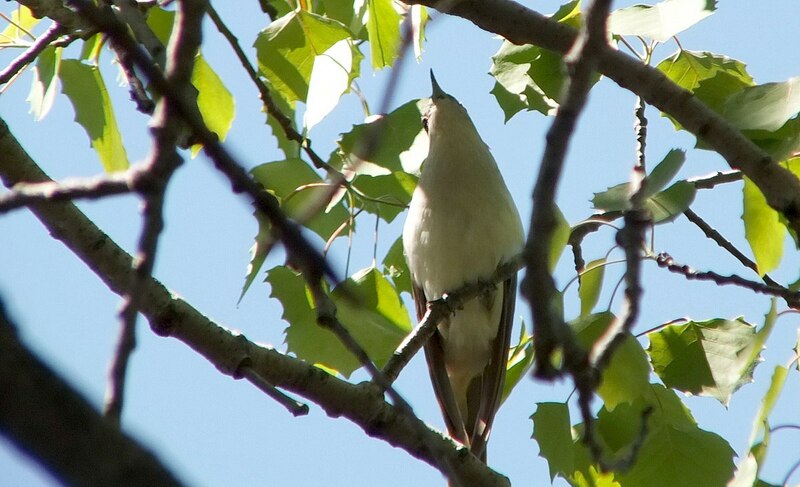 This was a bird that we had never seen before, but I recognized it as a cuckoo because of the down-turned bill. 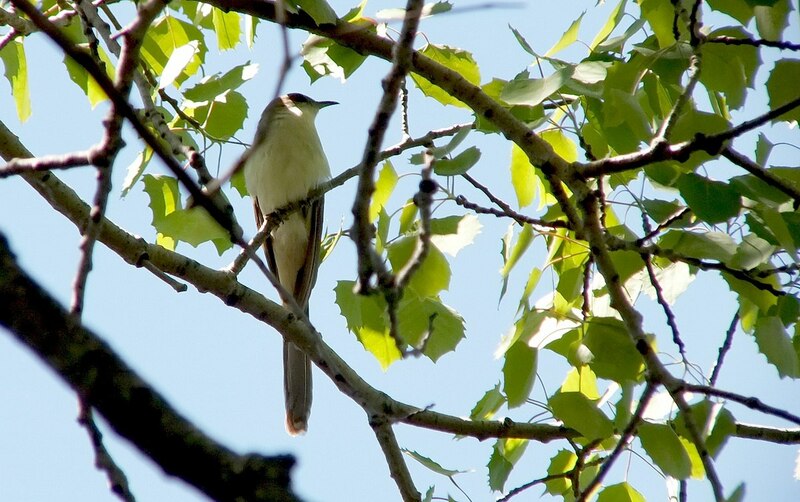 Bob’s video shows the cuckoo hanging on tightly as the tree sways in the breeze. Cuckoos are notorious for sitting still at length, waiting for prey, and then will hop or run to get at it. They typically eat caterpillars, grasshoppers, cicadas and katydids. One interesting fact is that the spines of spiny caterpillars often get stuck in the lining of the cuckoo’s stomach, so periodically the lining of the stomach is shed to get rid of the problem. Black-billed Cuckoos are alternately referred to as “Rain Crows” because they are known for calling more frequently when rain is imminent. It is a wonder that the cuckoo didn’t exercise its song the day we saw it because thereafter, we had days of rain. At that point on the trail, Bob and I were pleasantly surrounded by a deciduous forest and appreciative of the shade as the day turned out to be very hot. Lush, new spring growth fluttered in the breeze, and warm scents nudged from the damp grasses by a passing puff of wind filled our senses with thoughts of a mid-summer’s day. Considering that Black-billed Cuckoos are rather secretive, more often heard than seen, Bob and I were extremely lucky to have the opportunity to photograph and film this slender bird with the warm-brown plumage. 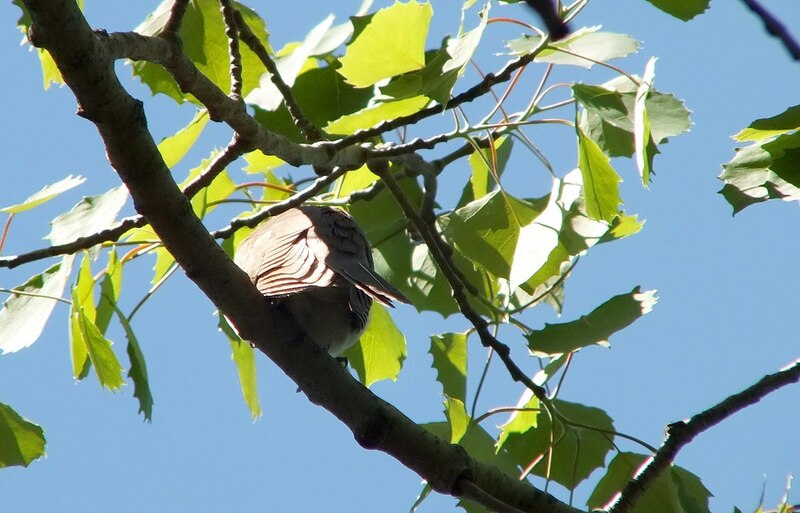 If not for the Eastern Towhee landing on a lower branch of the tree, the cuckoo would have remained undetected by us, lurking within the cover of leaves as we tread softly along the path. Only sometimes, do they engage in nest predation. Many times they will build their own nest in low shrubs or on the ground.